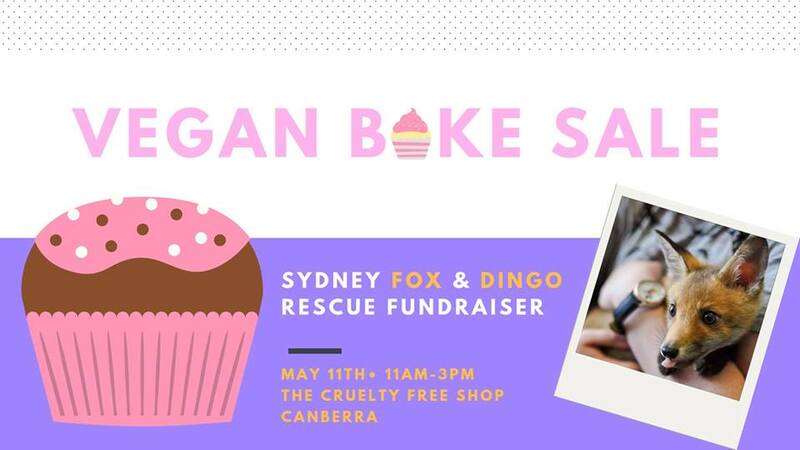 Home Archive by category "Contribute"
Join Sydney Fox and Dingo Rescue Saturday May the 11th from 11am-3pm for a pawsome vegan bake sale to raise much needed funds for our sanctuary at the Cruelty Free Shop in Canberra. Join us in celebrating all Mothers at our charity Mother’s Day Picnic! The more people we have helping out, the more students we can reach and the more animals we can save. 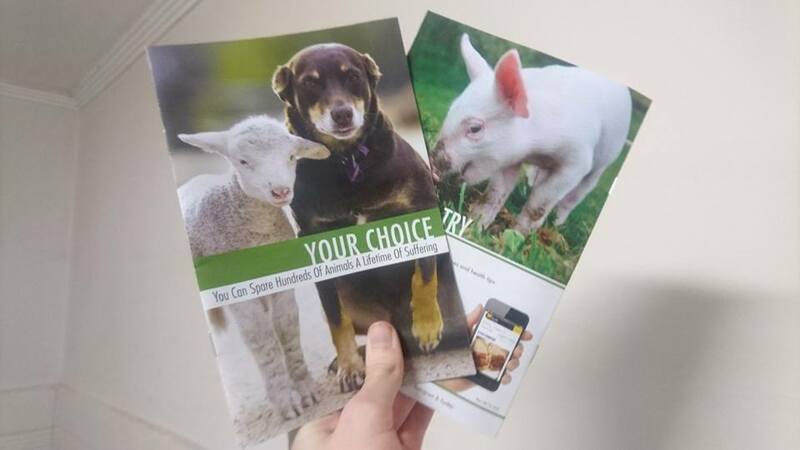 The main focus of Vegan Outreach is handing out leaflets about factory farming and veganism, particularly to students at university campuses. Leafleting is a super easy, fun and effective way to speak up for farmed animals. Strong evidence suggests that for every 75 people who read a Vegan Outreach leaflet, one of them will go vegan or reduce their consumption of all nonvegan foods to less than once per week. Considering the average person will eat several thousand animals over the course of their lifetime and that in a single day of outreach we can easily distribute a few thousand leaflets, the number of people we can encourage to go vegan and the number of animals we can save every day is absolutely enormous. Smiling and saying hello, offering the leaflet in a way that’s a statement instead of a question, extending your arm fully and placing the leaflet directly in their hand will all dramatically increase the amount of people who take a leaflet from you. It’s also a good idea to thank people who take a leaflet and to stand in the middle of the footpath, not off to the side. Some statements I’ve found work really well include “help animals”, “free information”, “help stop animal cruelty” and “info to help animals”. The link above explains how to leaflet like a pro in more detail, and the video below shows what that looks like in action. Did you know that ACT Libraries does not hold any current vegan publications? Canberra has an active vegan community and I think this should be reflected in the loans profile of ACT Libraries. 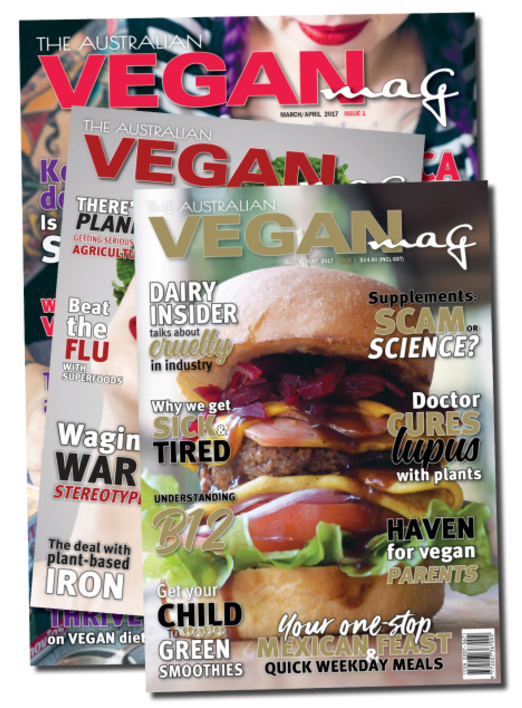 Please contact the library and suggest the purchase of The Australian Vegan Magazine! It may seem scary and intimidating standing before the public raising awareness about the truth and reality of animal industries, but if you’re passionate about your values and where you stand as a proud member of our vegan community this may be just the right thing for you! We all remember how nervous we were our first time participating in these experiences, but we gained confidence from the positive effects we are having on members of the public and by supporting each other when we’re out there on the streets together. Many people have shown an interest in attending outreach and activism such as protests, 1000 eyes experiences and the cupcake challenges and we understand some people may hesitate to attend due to being anxious or uncertain about how it will go and if it ends up having much of an impact or not, but as you can see from the photos and feedback we post we reach a lot of people and many people decide to make changes or even go vegan on the spot after taking the time to listen. This kind of activism isn’t for everyone, and that’s fine! We all have our own ways of planting seeds. But if you’re leaning towards giving it a go, be brave and join us. It feels truly amazing and rewarding to have discussions with people about the reality of animal agriculture and educate people on veganism. Everyone is welcome to stop by any of the events for a chat and to see how things run. Have a look at what we had on offer last time! Support the work of Vegan ACT by becoming a Vegan ACT Member… and GET AWESOME DISCOUNTS! If you would like to sign up as a member, and support the advocacy and support work of Canberra’s non-profit vegan organisation, Vegan ACT – you will also receive an amazing membership card which entitles you to discounts at all the best vegan haunts around Canberra, as listed below! Head to https://veganact.org.au/shop/ to sign up, and have a look through our other fundraising goodies for sale. Oxygen Nutrition @ Canberra Airport – New 10% Discount for Vegan ACT Cardholders! Lily’s Vegan Kitchen (New Vegan Business in Canberra!) @ Southside Farmers Market – Discount for Vegan ACT Cardholders! New Cruelty-Free Shop, Braddon – 10% Discount for Vegan ACT Cardholders! Rhubarb & Me Hair Boutique, Lyneham – 10% Member Discount + Vegan food while you wait! The Greenway Organic, Tuggeranong – 10% Discount for Vegan ACT Cardholders! On 19 July 2016, Animal Liberation NSW and Aussie Farms released the first-ever Australian footage of male chicks being ground-up alive as waste products of the egg industry (www.EggsExposed.com.au). 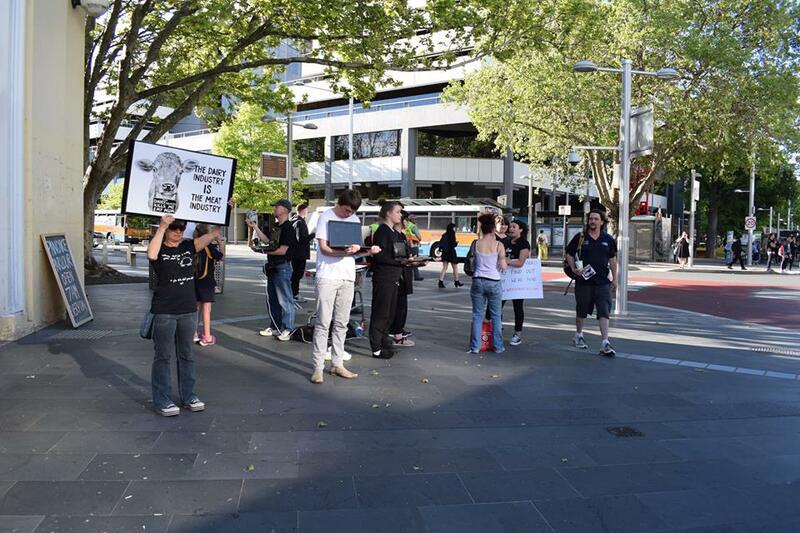 Two days later in an action organised by Aussie Farms, around 100 activists converged on the facility near Bendigo, Victoria, where the industry-standard practice had been filmed, with 21 entering the property to shut down the macerator and draw attention to the inherent cruelty of the egg industry. EggsExposed.com.au: The issues revealed in our investigation are inherent to egg production across Australia and the entire world. In addition to the male chicks being killed shortly after birth, and the females being painfully de-beaked, the females are then sent to live in cramped, filthy conditions in sheds with tens of thousands of other birds, and killed at just 18 months of age when their production of eggs slows. Egg farming will always be cruel – the most effective thing you can do to end all of this is to simply stop eating eggs and encourage others to do the same, by sharing the above video with them. Please also sign our petition below, asking the Australian egg industry to stop the mass killing of day-old male chicks. (Updated) Become a Sanctuary-Hand Volunteer at Little Oak! Little Oak Sanctuary is located under an hour from Canberra, towards the South Coast in NSW. We are a registered not for profit charity with a mission of providing sanctuary to animals in need whilst promoting compassion for all animals through education and cruelty-free living. This is our news! Little Oak Sanctuary is predominantly by its creators, James & Kate, with assistance from our community in the form of working bees. We’ve had great success with our first round of weekend sanctuary hand volunteers, and would like to thank Laila and Jennifer tremendously to their contribution to the sanctuary! We have reviewed the structure of our volunteer program and will be modifying the positions accordingly. 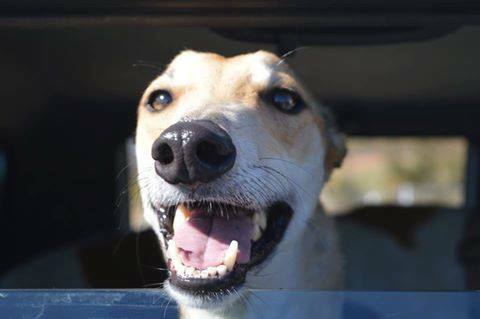 We are once more seeking expressions of interest for a Weekend Sanctuary hand position, the position will be unpaid (volunteer basis) as per all positions at Little Oak Sanctuary. Volunteers will be required to make a commitment of one day (max 4 hours) on the weekend at the sanctuary each MONTH. We hope to gather a group of between 8-10 committed individuals and will be rostering the time so that volunteers will be at the sanctuary in pairs. If this sounds like something you’d be interested in, please read on! This role is unpaid as a volunteer position (as are all positions at Little Oak at this time). It will require a commitment to attend the sanctuary once a month on either a Saturday or Sunday for a maximum of 4 hours, depending on sanctuary events such as open days. The role will require a commitment for a minimum three (3) month period, which may be extended if Little Oak Sanctuary and the volunteer both agree to an extension. 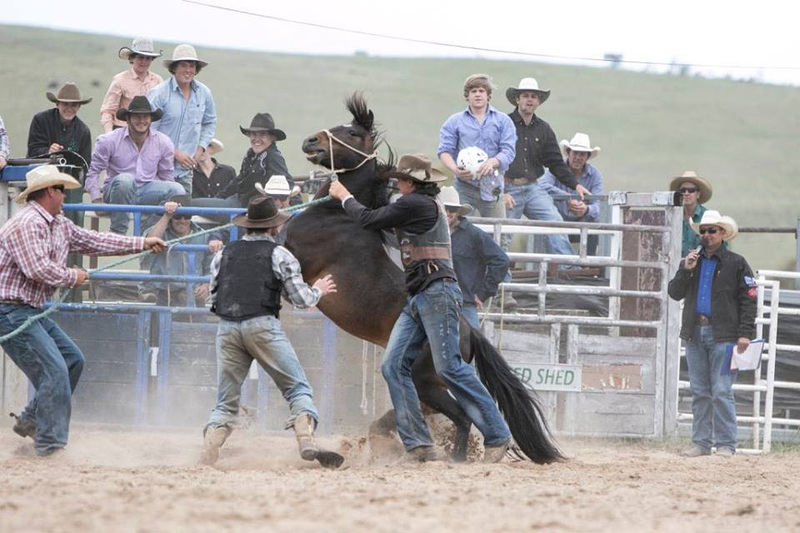 “The immorality of rodeos extends to the arrogance of the riders and their attitude to the animals, and to the way the audience is demeaned by watching such a tawdry spectacle.” Veterinarian, on attending an Australian rodeo. Early in November, we went along to the Bungendore Rodeo to bear witness to what the animals endure, and share their plight with the public. Rodeos are strongly opposed by the RSPCA and are indeed widely condemned by all animal protection organisations. Whilst we certainly appreciate how important for rural communities to come together and support each other, we disagree that this should come at the price of invoking fear – or a fight or flight response from animals for the sole purpose of entertainment. 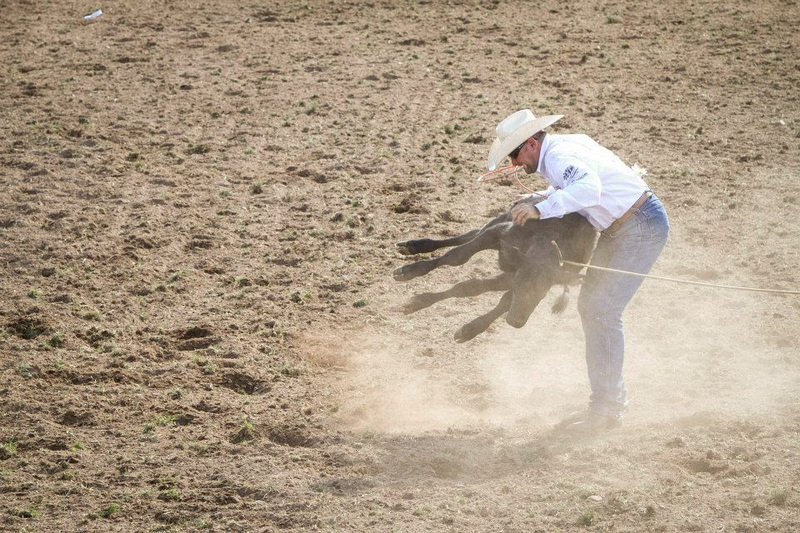 We have attended several local rodeos ourselves in order to witness first-hand what happens at these events. We have witnessed the fear and distress of the animals, many horses showed stressed facial expressions (extended upper lip, widened nostrils, lips drawn back, tail squeezed in, tensed muzzle, which suggest a negative emotional condition ), we have seen calves and steers having their tails twisted to ensure they exit the chute into the arena where they will be pulled backwards into the air before being body slammed to the ground. We’ve seen excessive electric goading of bulls prior to them entering the arena. We’ve seen horses so distressed by the flank strap that they continue bucking, crashing head first into the fencing before a steward is able to release the strap.Horses with a wide-open mouth were also observed, which has to be attributed to the described stressed facial expressions. From an animal protection point of view, the flank strap has to be seen as a cause of suffering (stress, anxiety, fear) and as a potential cause of pain. At this current event we saw much of the same, however we also saw something that we had not seen before, namely the “Wild Pony Race” where three men try to overpower a desperate, terrified pony – purely to create a spectacle for the audience. (Images attached). 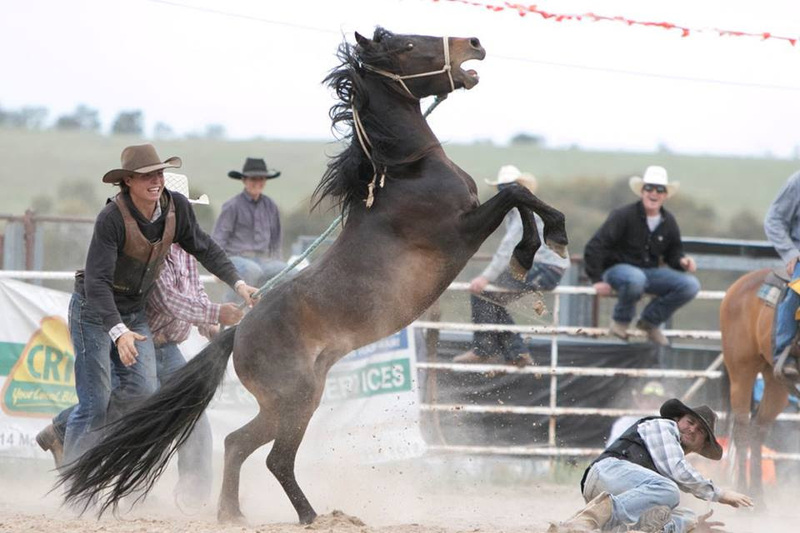 As it turns out the ponies taking place in this event at Bungendore Rodeo were not wild horses. They were in fact, well bred hackney ponies, several of whom had been broken to harness, several others halter broken. Why anyone would subject such valuable horses to this form of treatment and threat of potential injury is beyond our comprehension, but goes to show that horses don’t have to be ‘wild’ to be terrified by this event. 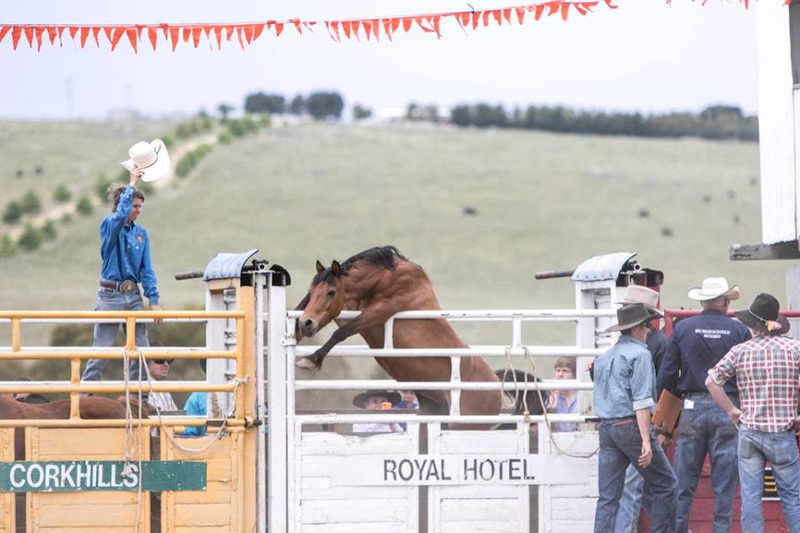 When the Australian Bushmen’s Campdraft and Rodeo Association became aware this event had taken place they were apparently very upset and are now investigating the inclusion of this event at Bungendore Rodeo as are NSW RSPCA and Animals Australia. 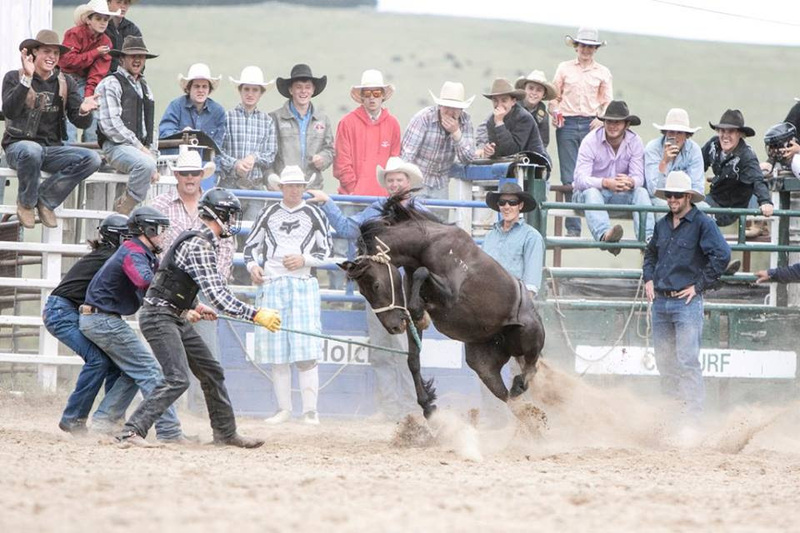 The Bungendore Rodeo committee perhaps knew this event would be controversial, having omitted it from the program, advertising it only as a “novelty pony ride”. It’s also worth considering the welfare codes that rodeos currently operate within. In 1988 the NSW Code of Practice said this event should be phased out by June 1989. It has been banned in South Australia and Victoria. In an attempt to make it appear more palatable it now occurs under the name of “rope and tie” but is in fact the exactly same event. The welfare codes that the Rodeo operates under are also supposed to be reviewed every two years (The Code is based on knowledge available at the time of publication and should be reviewed at intervals of no longer than 2 years to maintain the highest possible standards). Currently they have not been reviewed for over 27 years (Last Reviewed 30 April 1988). Tormenting frightened and unwilling animals in an attempt to demonstrate the ‘brute strength’ of man is a spectacle that has no place in modern society. Please join other caring Australians who object to animal abuse by pledging never to support these cruel events. Click here to sign the pledge to ‘Say No to Rodeos’, and ask your family and friends to do the same! 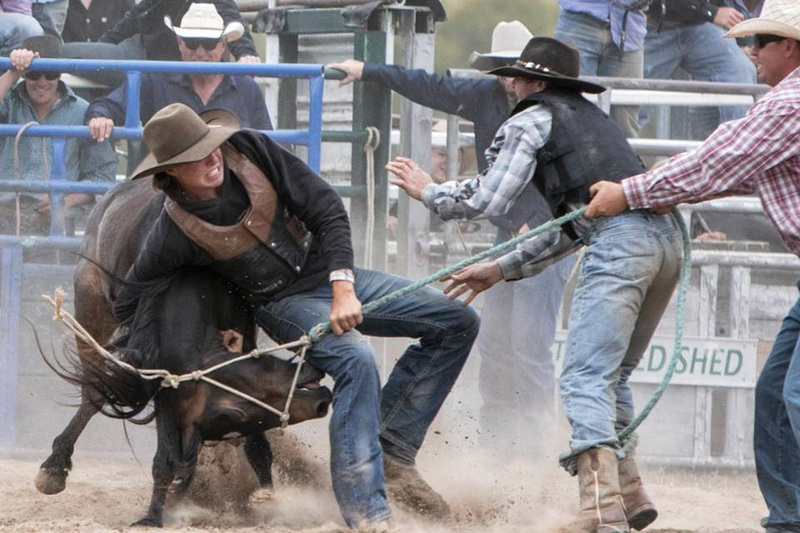 Write to your local MP or local council, as well as your local newspaper, stating the facts about the cruelty of rodeos and why they should be banned (Note: Rodeos are permitted in all States, and the NT, but not in the ACT). Write to rodeo sponsors. Rodeos would not be financially viable without sponsors. If you see signs advertising Rodeos that mention sponsors, write to them and let them know why they shouldn’t be supporting these events.